At Mexico Dental Implants, we offer the best quality, at affordable prices for dental implants in Mexico. Our high-quality dental implants at Mexico Dental Implants provide a long-lasting cosmetic and oral health solution for adults who struggle with lost teeth. Our affordable dental implants in Tijuana look like natural teeth, but the root is made out of a titanium screw that is surgically affixed into the jaw bone . Our medical-grade titanium is bio-friendly, eventually bonding directly to the bone. This makes the implant secure and stable for decades with good oral hygiene. There are several aspects to dental implantation that our dentist in Mexico would like you to know about. • First, unlike fixed-bridges, the implants we use here at Mexico Dental Implants stand-alone and do not require the sacrificial grinding down of adjacent teeth in order to apply caps as anchors for fixing the bridge. • Titanium implants help to preserve the jaw bone. When a patient loses a tooth, sometimes the bone fills itself in, but frequently the bone starts to deteriorate. This can put the adjacent teeth in danger from the roots out. 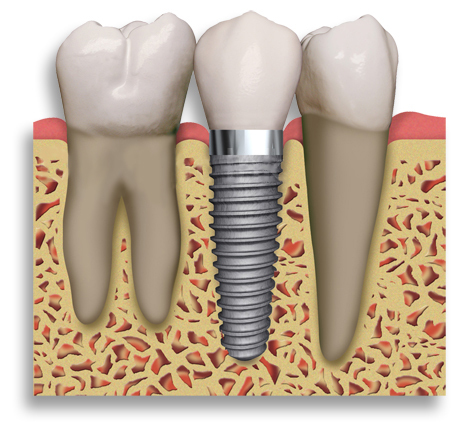 The titanium implant screws used by our dentist in Mexico actually stimulate bone growth in the jaw. • Unlike a fixed bridge, implants can be brushed, flossed and rinsed in the same way as your natural teeth. This reduces the incidence of serious oral health problems down the road. • This is also a cost-effective solution for rescuing your smile; our affordable dental implants in Tijuana last longer and come with fewer detrimental oral-health problems over the long term. So while they may initially cost a little bit more, over time there are fewer painful and expensive replacements and periodontal disease costs. Having the procedure done by our highly-skilled, experienced dentist in Mexico will also save you money for the same high-quality results you can expect in the U.S.
Our Tijuana dentist is skilled at using dental implants in multiple applications for a wide variety of patients. 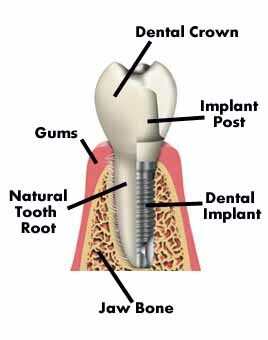 Our implants can be used to simply replace individual teeth. But they can also be used anchors of a fixed bridge to replace multiple teeth (in order to preserve healthy natural teeth and bone). • Because it takes time for the bone to fully bond with the titanium screws, recovery time can be considerable: up to 4 months for upper teeth and 3 months for lower teeth. Our implant specialist does not use any “teeth-in-a-day” implants because they will never fully bond to the bone and usually need to be replaced in 5-8 years. • People who already have jaw bone damage or chronic conditions that compromise the health of their bones (diabetes, radiation therapy near the face and neck, advanced periodontal disease, smoking, etc.) may not be good candidates for implantation.